While I’m really loving Dreamweaver CS5 and all of its new features, it’s funny that there are so many features that I’ve just taken for granted for too long. In fact, if you’re like me, you’ve even begun to forget features – only to “rediscover” them later! The Snippet panel is one such feature. At a recent conference, I had the chance to ask a former Dreamweaver user why he’d begun using Coda instead. One of the reasons he cited was Coda’s snippets feature (called Clips in Coda). I couldn’t help but laugh – and point out that Dreamweaver not only has a snippets panel, it’s been in the program for over 10 years! If you’re like me, your screen is never big enough. 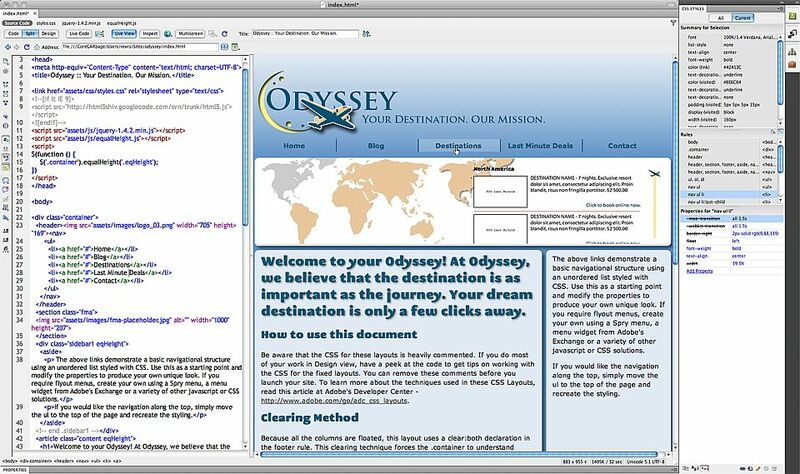 When I’m working in Dreamweaver, I want to see my code, my design (in Live View) and my CSS panel. The first time I fired up CS5, I created my own customized workspace which you can see below. Basically, it’s just my CSS panel that I have left open. The other couple of panels that I use on a regular basis (Files, Snippets and Insert) I’ve collapsed to their button state. I’ve been using this workspace so long now, that I tend to forget what the default DW workspace even looks like! The only issue that I’ve had is that I still find myself toggling the panels on/off using the F4 keyboard shortcut so that I can see more of the design. Well, I just found out, that I can keep them toggled close – and still get to what I need quickly! (Head slap here) First, use F4 to toggle your panels off. Now, when you need them, simply move your mouse all the way to the edge of the screen that you’ve hidden the panels – and, viola, there they are! Click back in your page and they hide themselves again.